For the early detection of common eye ailments, Forus Health, has developed ‘3nethra’ which works at a very cost-effective model. Sofomo Embedded Solutions markets Lifeplot, which is a 12-Lead mobile electrocardiogram (ECG). Next Services has created enki – a mobile electronic health record platform. Agatsa is developing Sanket – a pocket sized ECG with a display which is wireless. The number of smartphone users is rapidly increasing in India which has made these start-ups turn our phones into medical devices. Gujarat based Azoi Mobile Technologies, is launching an iPhone case that tracks blood oxygen level, blood pressure, ECG, respiration, temperature, and has an attachment for reading lung functions. India’s first tricorder (an android based mobile system called the Swasthya Slate) which can be perform 33 diagnostic tests covering basic tests and also tests for pregnancy, dengue and malaria. All this for just INR 34000. 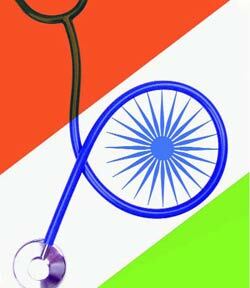 Don’t you think India soon could be a leading force in Healthcare IT. Infact, that’s what India excels in – Information Technology!